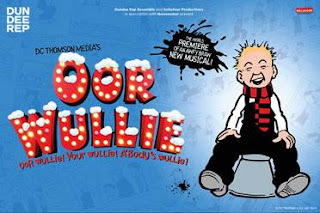 Dundee Rep Ensemble and Selladoor Productions in association with Noisemaker, are to bring Scotland’s favourite comic strip scamp DC Thomson Media’s Oor Wullie to life live on stage. The new musical adventure will run at Theatre Royal, Glasgow from Tuesday 21 January for five nights as part of a Scottish tour. Oor Wullie has featured in DC Thomson Media comic strips in the Sunday Post for more than 80 years, earning him the title of ‘Scotland’s Favourite Son’ in a public vote in 2004. The iconic laddie from Auchenshoogle is much loved for his big heart, constant war against boredom and his mischievous energetic pranks which often land him in a scrape or two! Now you can see the spiky-haired scallywag live on stage as he embarks on an adventure with pals Fat Boab, Soapy Soutar, Wee Eck, and the rest of the Sunday Post gang – the only question is; where’s his bucket? !